Home » Blog » The map! Very interesting! We had a good time. I’m working on getting our work on my blog, now. Do you have any idea when the next one will be? We had some interest here, but agreed that we need to know ahead of time. My sister happened to send the information to me and, by the time I figured things out, the event was almost here. And, by then, most people had plans with lots of events going on here that day. I know that there were 6 or 7 people drawing downtown here. With more advance notice, I’m sure that there would be more people in the area drawing. Thanks for doing this. I’m just asking. we enjoyed it. I even had my grandson out, though he was a bit cranky and more interested in a toy. But, later, I’m sure that he will draw something that he saw, or talk about the event! 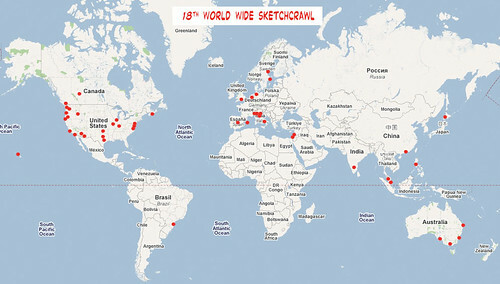 Hi , can anyone provide me with a contact for Sketchcrawlers in Adelaide, South Australia? You there! Stick in Dublin, Ireland. We’re meeting at the spire tomorrow at 11:00. Probbly. Hi there, i wanna promote next time a SketchCrawl here in So Jos dos Campos – SP – Brazil. What i have to do?